Discussion in 'APBT Bloodlines' started by tonkaboytochie, Jun 29, 2011. Great dogs!!!! Here's mine. Bout to get female from them. Just wanted to add that they breed great hunting dogs. When I put the Cowhide in front of mine he goes absolutely crazy. His eyes widen and will do anything to get at the hide. There was no playing with him to get use to the hide. He wanted it the minute he saw the hide. I'm going to take him on a hunt soon. Waccamaw is also known for having game dogs. 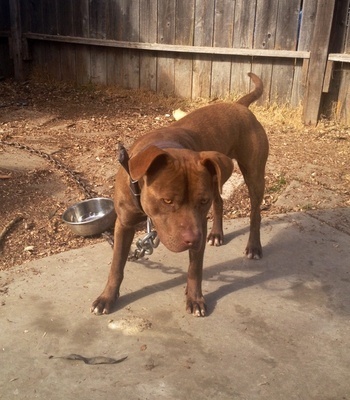 They are one of the top kennels for Redboy/Jocko blood. Great kennel in my opinion. i thout big john was stolen? was the breeding from straws they had? Tonkaboy you should post the ped!!! http://www.gamedogped.com/details.php?id=58415 i have this right now ,but im about to get on ped online. That's a good ped, I would be happy with one bred directly from them. WAC haz som 'DAMN' fine houndz;-) Remember, talking 2 WAC yearz ago bout 'BIG JOHN'... & HE waz a "DESTROYER"... YES! He waz stolen... Afta dat... WAC put up a privacy fence & acquired a "SHEPARD" 2 protect hiz yard... The funny thing iz... HE thought 'BIG JOHN' waz the only 1 out der who culd hav beaten "MAYDAY":-) hehehe!